That rare attribute helps explain why Corporate Knights has named Vancity Canada 2016’s Best Corporate Citizen. The credit union was also awarded the top spot in 2013. 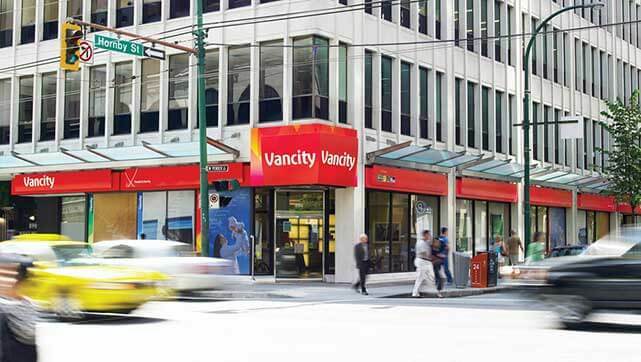 Owned by its 515,000 members, Vancity is dwarfed by the big Canadian shareholder-owned banks. Its assets of $19.8 billion amount to less than 2 per cent of the balance sheet of Royal Bank of Canada, the country’s largest financial institution. It has fewer than 2,600 employees, and just 59 branches in Vancouver, provincial capital Victoria and British Columbia’s Fraser Valley. “A lot of smaller local banks see Vancity very much as a role model,” says Peter Blom, chief executive of Netherlands-based Triodos Bank and chair of the Global Alliance for Banking on Values, of which Vancity is a member. The alliance’s 28 members, mostly cooperative and community banks and credit unions, promote sustainable banking as a way of improving their communities and society at large. Vrooman, who was B.C.’s deputy finance minister from 2004 to 2007, chairs the alliance’s North American chapter. Vrooman’s efforts to immerse senior staff in social responsibility and environmentally sound banking “is a real source of inspiration to the CEOs of other, smaller organizations,” Blom says. He cites a small bank in Melbourne, Australia, that is modelling itself on the Canadian credit union. Vancity also helps train young “social bankers” from other countries. Even as many of the world’s biggest banks find themselves in the political crosshairs, Vrooman sees the financial services industry as a powerful force for good in society. “The allocation of capital – what kind of firm, what kind of person does and doesn’t get access to credit – is probably the single most positive force in creating the future society that we want,” she says. The credit union’s drive to burnish its do-good credentials takes many forms. For example, the influx of refugees to Canada has been a golden opportunity to pursue both social responsibility and the bottom line. Vancity offers to open bank accounts for government-assisted refugees within two weeks of them stepping off the plane. Last fall, in anticipation of the arrival of thousands of Syrians, it expanded the number of branches that process refugee accounts from one to five. Its members can also obtain interest-free, seven-year loans of up to $50,000 to provide accommodation for a refugee. On other fronts, Vancity claims to be the biggest organization in Canada to stick to a “living wage” policy for its employees; in other words, pay that significantly exceeds the legal minimum wage and is sufficient to meet basic living needs. Vrooman earned a base salary of $441,000 last year. Performance-related bonuses added another $522,000, making a total of $963,000. She declines to disclose projects currently in the pipeline, but points to Vancity’s alternative to payday loans as an example of where the credit union is heading. Customers with low credit scores or no credit history can obtain a Vancity “fair and fast loan” of between $100 and $2,500 within an hour at an annual interest rate of 19 per cent, compared to the typical 60 per cent favoured by the industry. Vancity arranged almost 1,000 of these loans last year.